I wanted to kick the festival off with its opening night selection, so after trying to gracefully descend from the Venezia Turismo motor boat, driven by the handsome "Commandante" -- as he jokingly referred to himself -- and checking into my hotel, I joined the line at the screening for Everest in 3D, directed by Baltasar Kormákur. 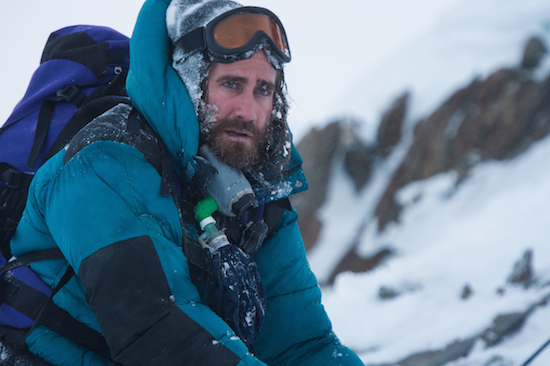 Everest is based on a true story, of an expedition done in 1996. Let me preface this by saying that I'm more of a beach girl myself. And 3D glasses these days are so bulky they weigh too heavily on my nose. Also, when I'm watching a film I like it to be my eyes to the screen, an intimate affair, not interrupted by some virtual reality type goggles that I need to keep on at all times to see the film properly. But then, it can be truly a wonder to admire Jake Gyllenhaal in all his 3D wonder... And Sam Worthington ain't so bad either. While I didn't find the film perfect and felt it could have enjoyed an extra layer of editing, I learned a lot from Everest. I now know what Hillary's Step is and where exactly it places on the climb up to the peak of Mount Everest. I also now know that our bodies aren't meant to climb to the altitude of a Boeing 747 and they begin dying a little at those heights. But most importantly, I understand what makes those seemingly insane fellow human beings go on these mind-blowing journeys up these unconquerable mountains. While I often thought it was ego, it is about so much more, and better than that. A mix of desperation, humility -- at the grand scale of the universe that we are absolutely incapable of comprehending in all our smallness -- and a need to find fellowship through those who can know and understand us, climbing is a passion that while dangerous, can end up our savior in the end. Even it it kills us. Everest is a wondrous, beautifully shot, perfectly acted, very Hollywood film and I could swear I felt snow brush against my face at one point. It's perfect entertainment. Yet entertainment for me is about so much more. My favorite films have always turned out to be those that teach me something, let me walk away richer, wiser for having watched them. So meeting Michael Rowe, an award-winning Australian filmmaker who lives in Mexico and whose latest film Early Winter takes place in the winter of Canada, was the perfect way to spend a Venice afternoon. Rowe's film is a languid, thoughtful, heartfelt look at a couple, two human beings who live within the usual shades of grey we all inhabit, and from the outside, we know they're disastrous for one another. But as is often the case with couples, they are the last to know. Early Winter for me was the perfect example of why getting to know a filmmaker better can enhance the viewing the experience. It's the idea I try to promote through my writing, that if we connect as human beings we can understand so much more than if we take everything at face value, or as "just entertainment." After meeting Rowe I feel the need to watch his film once again, at least, and discover new nuances within his work, ones I may have missed before gaining insight into his grace. For my next viewing, I decided on another must-watch in Venice, Cary Joji Fukunaga's Beasts of No Nation. With Netflix releasing the film through their online platform at the same time as its theatrical release in mid-October, Fukunaga's oeuvre is going to be one of those groundbreaking production that, no matter what, will change the way we watch and enjoy cinema. Plus, it stars Idris Elba as the "Commandant," a charismatic, Shakespearean, larger than life character, who heads a group of child soldiers in a purposely unnamed African country in the midst of civil war. And we know Elba always changes things -- he's definitely changed the way I watch cinema, and TV with his presence. I'll admit, it was hard for me to sit through all the violence, physical and emotional, of Beasts of No Nation. It's not my kind of film but it is also artfully made and teaches moral lessons at every turn. It's eerie how Agu, the main child protagonist played perfectly by newcomer Abraham Attah, goes from being a boy to becoming a soldier in just a few shots, and how the author and filmmaker justify the transition. From victim, we most easily become perpetrators, violence begets more violence and personal motivation, the right incentive, is all a person (even a child) needs to turn vicious. The Commandant manipulates his army of youth with his paternal vibes and voice, the promise of great riches (money is always the primary cause for conflict) and the kids seek approval from their father figure. Classic and thoroughly effective. The dialogue at times seemed almost unnecessary, and the forced accents and mannerism of speech disturbed me in the long run. I can still hear the work of what must have been endless hours for the cast with the same dialect coach today. I wish that wasn't the strongest effect I took away from the film. "Everest" courtesy of Universal Pictures, "Early Winter" courtesy of Venice Days and "Beasts of No Nation" courtesy of Netflix, all photos used with permission.